Adam Rawson, winner of the 'Slider Decider' min- burger competition two years in a row, is opening a mini burger pop-up in Kingsway, Holborn for the summer, with several of his creations on offer. Snack on the the Beef Encounter (aged grilled beef patty, special burger sauce, American cheese, shredded lettuce, pickles), Pluck Me (buttermilk fried chicken, yuzu mayo, shredded lettuce, pickles), or even the Lambtastic (lamb and mint patty, cumin, smoked yoghurt, jalapeno, Stilton, aioli, watercress) in mini sizes, with boxes of up to 12 to take away or for delivery. Soft launch starts on Monday 5th June (50% off - register here) before opening fully on Monday 19th June. "This summer will see Londoners get their first chance to try Bite Me Burger Co., with the mini-burger brand set to open a new pop-up restaurant on June 5. 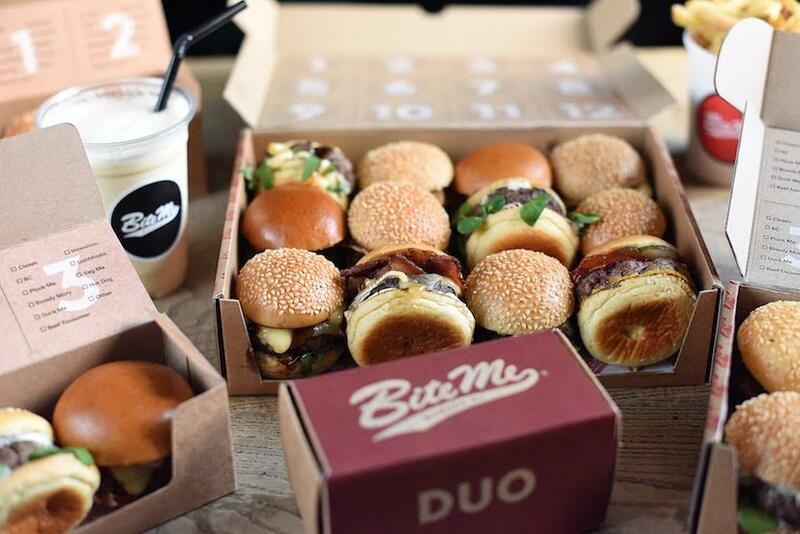 Based within an existing Holborn restaurant, Bite Me Burger Co. will be Making The World A Burger Place, with Chef Adam Rawson serving up a menu of mouth-watering mini-burgers, available in boxes of up to a dozen! A two-time winner of London’s prestigious Slider Decider competition, Rawson has created a menu that combines well-loved burger classics with some more unusual flavour combinations. For example, the Beef Encounter (aged grilled beef patty, special burger sauce, American cheese, shredded lettuce, pickles) is a tribute to the Big Mac, while The BC (aged beef patty, cream cheese aioli, bacon, Brie, crispy onion) is Rawson’s version of a bacon cheeseburger. For those who like their sliders a little more leftfield, the Duck Me (duck patty, truffle mayo, smoked hoisin, Swiss cheese, rocket), Pluck Me (buttermilk fried chicken, yuzu mayo, shredded lettuce, pickles) and Lambtastic (lamb and mint patty, cumin, smoked yoghurt, jalapeno, Stilton, aioli, watercress) all make for interesting alternatives to the classic beef patty. Meanwhile, the Veg Me option allows diners to swap out their patty for fried aubergine, so vegetarians needn’t miss out on any of the fun. On top of that, Rawson will regularly add seasonal specials to the menu, ensuring diners receive a steady stream of new favourites. Fries come dusted with pink Himalayan salt, while there’s a non-burger alternative in the form of a traditional Hot Dog, topped with crispy onions, tomato sauce and American mustard. The drinks menu is dominated by a selection of thick, American-style shakes, with flavours including Coconut, Peanut Butter and Oreo. 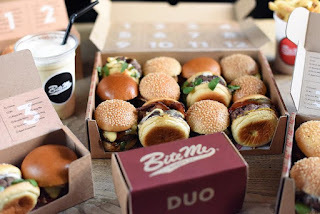 Mini-burgers will be served as Duos (£9), Trios (£12.50) or Quads (£15), allowing diners to mix and match their choices, while a sharing feast of twelve mini-burgers, four fries and four shakes (£59) will also be available for groups and for delivery. Sharing a space with Cha Chaan Teng on Holborn’s Kingsway, the pop-up restaurant is the brainchild of David Michaels, who first designed the concept in Sydney back in 2007 and is also the author of burger bible The World Is Your Burger: A Cultural History (to be published in the UK on June 5). Bite Me Burger Co. is owned by Andrew Hart, Paolo Manzi and Robert Manzi, who plan to follow up the pop-up with a permanent bricks and mortar site, set to launch in a West London location this autumn. Bite Me Burger co. will open with a soft launch offering 50%-off food and shakes on June 5-7, with diners able to claim the offer by signing soft launch offering 50%-off food and shakes on June 5-7, by signing up at www.bitemeburgerco.com. The restaurant will then fully launch on Thursday June 8."